This practical and comprehensive guide provides an introduction to everything family historians need to know in order to trace their ancestors in Hertfordshire. Every aspect of our ancestors' lives has been considered, from their birth and baptism to their death and burial. Examples of source material, together with photographs and drawings from the collections at Hertfordshire Archives & Local Studies, illustrate the text. The book is thematic in approach and systematically covers all the key sources: births, marriages and deaths; household and property records (census records, electoral registers, tax returns, etc); records for specific professions and occupations; crime and punishment (court records, gaols and transportation); the poor and the sick; schools and education; military ancestors. It will be an essential purchase for family historian throughout Britain and abroad whose ancestors came from Hertfordshire. In each chapter a brief background to the subject is followed by a description of the kind of records you can expect to find, including their usefulness to family historians, and details of where those records are held. The emphasis is on sources available in Hertfordshire, and particularly those held in the Family History Centre at Hertfordshire Archives and Local Studies (HALS) in Hertford, but all major sources are covered irrespective of location and web addresses allow preliminary searching to be done online. A wealth of experience from family historians and the staff at HALS is passed on in the form of tips and vital information. Appendices provide useful addresses and websites, and also list in detail the availability of essential sources such as parish registers, nonconformist registers, and the whereabouts of wills before 1858. Hertfordshire Archives and Local Studies (HALS) is the publicly funded archive and library of material relating to the history of the County of Hertfordshire. It is part of Hertfordshire County Council and the staff are experienced in advising family historians. HALS has a Family History Centre offering the most comprehensive collection of records for family historians in the county, and experienced staff offer fee-based research for enquirers unable to visit. 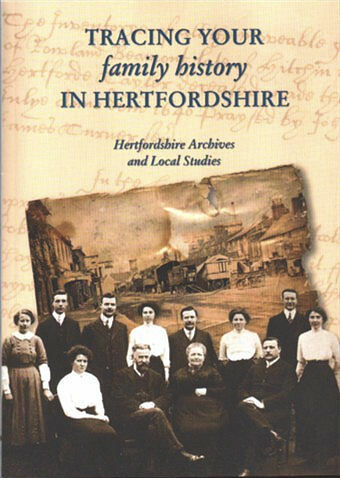 Tracing your family history in Hertfordshire; Hertfordshire Archives and Local Studies (HALS). Hertfordshire Publications (an imprint of the University of Hertfordshire Press), 18 May 2003. My own reaction is that this book is an essential introduction to kinds of records that are available - with key references and tables where appropriate. Everyone seriously researching their Hertfordshire Ancestors should have a copy and you can expect frequent references to it in future answers.